Rep. Rahm Emanuel is an alumnus of the Clinton White House and will be President-elect Barack Obama's chief of staff. He was the inspiration for Josh Lyman's character on "The West Wing." His brother, Ari, was the basis for "Entourage" character Ari Gold. A Democratic strategist dubbed the soon-to-be White House chief of staff "a cross between a hemorrhoid and a toothache." Sure, there are divergent views on Rahm Emanuel but few would argue that having the fiery former Clinton aide known for his profanity-laced vocabulary back in the White House is going to be interesting. It was as a senior White House adviser in the Clinton White House from 1993 to 1998 that Emanuel's hard-driving personality became so well known it was used as the basis for the fictional Josh Lyman character as a top adviser to President Bartlett on the hit TV series "The West Wing." Meanwhile, Emanuel's brother Ari became so successful as a top talent agent in Hollywood that the in-your-face Ari Gold character on HBO's "Entourage" was modeled after him. Emanuel is well-versed in the ways of Washington. The third-term congressman is the fourth-highest ranking Democrat in the House and is credited with Democrats' 2006 success as head of the Democratic Congressional Campaign Committee. He perhaps best known for his abrasive style and his take-no-prisoners attitude -- filling the role of the bad-cop to the president-elect's cool-tempered good cop persona. "I always tell the staff failure is not an option," he told the Washingtonian in May. "You never give in, and you never give up." The legend of Emanuel is almost bigger than the man himself. It was rumored that when Emanuel became upset with a pollster over a congressional race, Emanuel mailed him a dead fish. He also reportedly began stabbing a knife into the table as he rattled off a list of Clinton betrayers during a celebratory dinner. "Don't f--- it up," he allegedly told Blair. The Type-A Illinois congressman has developed a reputation for being hard-headed and combative in Washington has has grappled with policy-makers on numerous occasions -- earning him an equal number of accolades and criticism. The 48-year-old tough task-master grew up in a suburb of Chicago, where family dinners were equated to political free-for-alls that required preparation. 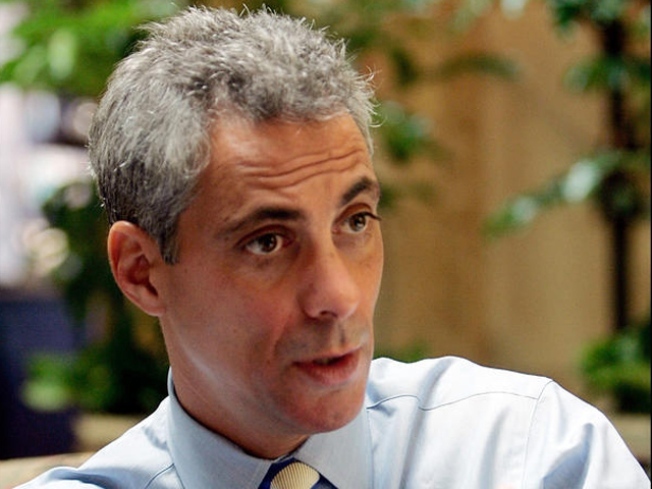 "You had to get ready for dinner conversations at our house," Emanuel told the Washingtonian. "You didn't just come down to dinner and say, 'How was your day?' You either came ready or you got shut out." Emanuel's father was a pediatrician who moved from Israel to the U.S. in 1959 and his mother a civil rights activist who ran the north-side branch office of the Congress for Racial Equality -- Emanuel and his brothers would often accompany her to marches, the Washingtonian reports. He was taught to swim at 18-months old and was encouraged to take ballet lessons -- eventually being offered a Joffrey Ballet School scholarship but turned it down and attended Sarah Lawrence College instead. At age 17, he severed off half of his middle finger while working at an Arby's restaurant and refused treatment because he wanted to go to prom. He nearly died from the infection. There's no doubt Emanuel will be a feisty -- though some say he has mellowed since his days in the Clinton White House. Still, his new role should suit him well. "Like the record amount of voters who cast their ballot over the last month, I want to do everything I can to help deliver the change America needs," he said in a statement. "We have work to do, and Tuesday Americans sent Washington a clear message -- get the job done."